Christmas week is here and life is busy. So much to do, places to go, people to see, food to cook. A person can get lost in all of that and be tempted to grab a box of something or stop for fast food that you’re not totally sure is gluten free. DON’T DO IT! This is the time of year you need to take extra special care of yourself. Make sure you are getting enough sleep and that you are drinking lots of filtered water. That will go a long, long, long way to keeping your energy up and protecting you from getting sick. What is your favorite fast food to make? These take a few minutes to prepare, put them in the crockpot during the day and dinner will be ready when you are at night. Are you still looking for that last minute gift. Here are some of my favorite gluten free cookbooks for the gluten free cooks in your life. shhhh….. If that’s you, Santa could always buy you the book. I won’t tell. You can visit my Store for a quick purchase (thank you, Amazon gives me a small tip when you purchase) or visit the authors blogs. I’d like to wish you and your family peace and joy during this holiday season. I hope you get to take a little break along with me. I will be taking some time off to visit with family, relax and do a little planning for 2010. I have some exciting things in the works that I can’t wait to share with you. Those who receive my newsletter will read about it first! If you’re celebrating this week, Merry Christmas. Lovely post and nice reminder to take care of ourselves. I think we all have a tendency to get so wrapped up in shopping, baking, wrapping, parties, etc. that we forget that our first priority is making sure we stay healthy! My mom had to remind me of that when I kept offering to bake more and more food for Christmas day. Oh goodness, I'm on the blog in half-asleep mode. Andy- Thank you. Not to worry, Shades was in half-sleep mode too. Merry Christmas, Diane! Great post! Thanks for the reminders. 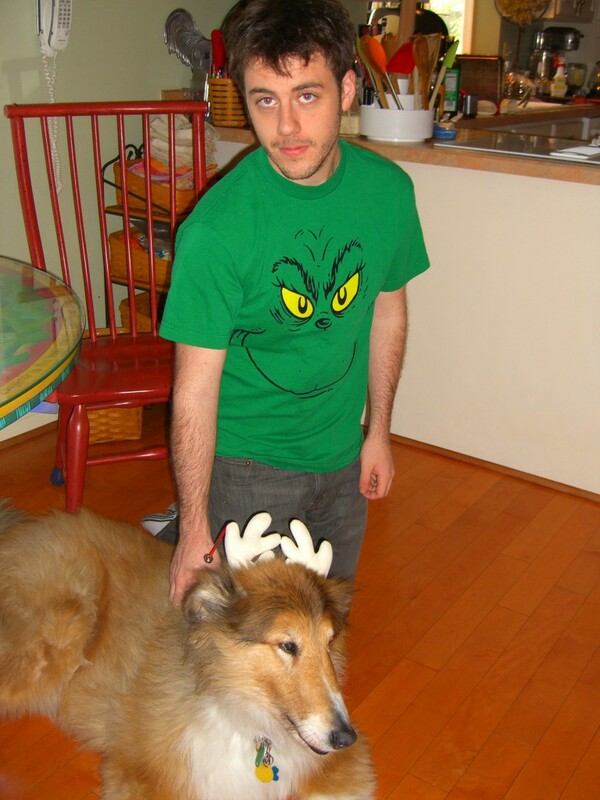 Tell the "Grinch" and "Max" they both look fine. How did I miss meeting Shades when I visited you? Bummer. Shirley- I'm finally getting back to my comments. Loved this one. Thank you. Nice, and helpful post. Enjoy your time with your family. Merry Christmas to you and yours! Heather- sorry for the slow reply. Hope you had good holiday.